1. Is the design relatively ornate? 2. Is the piece mahogany? 3. Does it have a branded signature? 4. Are the fittings prominent, ornate and distinative? 5. Is there any applied brass or bronze decoration? 6. Are the feet joined by arched stretchers? 1. Are pieces in pale wood, such as pitch pine? 2. Is there any stencilled decoration? 3. Is the form relatively simple? 4. Do the joints incorporate reised metal studs? 5. Does the decoration employ circles and/or squares, combined with decorative lines, laid out in a symmetrical arrangement? 6. Does the piece incorporate painted tin plate? Born in Li�ge, Serrurier-Bovy became one of Belgium's leading Art Nouveau designers. His early work owes much to French and English design, particularly that of William Morris and the Arts and Crafts Movement, and pieces tend to be symmetrical, with restrained curves. He worked mainly in mahogany. 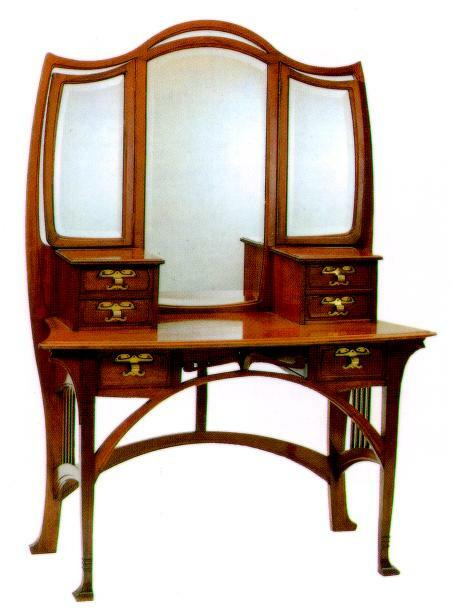 The mahogany coiffeuse in the main picture, from c.1900, is typically architectural in form. Although solid, forms are often enlivened by the use of brass finings, and curved elements. Serrurier-Bovy's later work owes more to German or Viennese design. From 1902, he produced the "Silex" range of ready-to-assemble furniture in kit form. * Serrurier-Bovy's clocks are also architectural, and often feature brass appliqu�s, with Arabic numerals inscribed onto Loetz glass (see page). Serrurier-Bovy's inexpensive "Silex" range came about through his belief that everyone should have access to beautiful furniture. Pieces included tables, chairs and bedroom furniture. The night table, below, is typical in its use of simple geometric forms, pale wood, painted sheet metal, stencilled motifs and decorative studs. 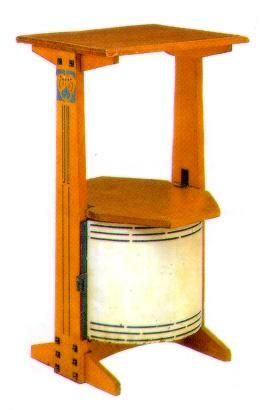 Serrurier-Bovy produced many lamps, as well as hat and umbrella stands and ceiling lights in the style of that above. The use of horizontal bands in this case, three toward the base and two below the shade is typical. There is no surface decoration, but the minimalist design incorporates some florid features, such as the curving vertical side-pieces and the D-shaped spurs on the top rim of the shade. The screwheads on the lower horizontals are left exposed. * Metalwork vases were made, usually combined with glass. Serrurier-Bovy's work is usually signed, often with a branded signature. Silex furniture is sramped "SILEX". * As when first made, Silex furniture is less expensive today than other Serrurier-Bovy pieces.